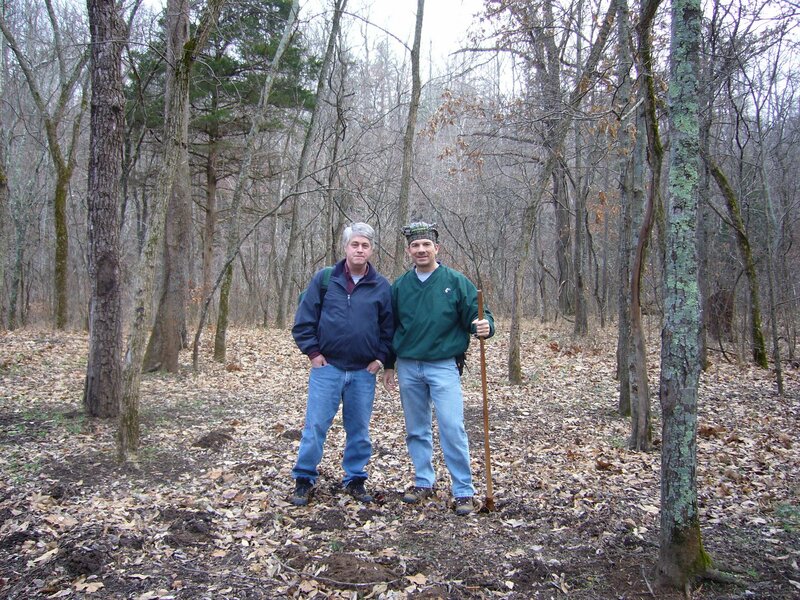 Last Saturday Rich and I finished the Trace Creek Section of the Ozark Trail by hiking the upper 12.5 miles of the section – from Hazel Creek to the Hwy DD crossing. Today was a special day for us – we would be completing our 200th mile of the Ozark Trail! Unfortunately, I came down with a cold the day before, making it somewhat difficult to fully enjoy that milestone. Nevertheless, it was a milestone that we’re quite proud of. Since we started hiking the Ozark Trail some 7 years ago, we’ve completed the Taum Sauk, Middle Fork, Blair Creek, Current River, Between The Rivers, Eleven Point, and – now – Trace Creek Sections. Of these, the Taum Sauk Section is unquestionably the finest, crossing the rugged granite outcroppings of the St. Francois Mountains, and the Eleven Point Section with its towering bluff top views is a close second. We still have much to see, however. Completed sections still awaiting us are the Karkaghne, Marble Creek, Wappapello, and Victory Sections, and the Coutois and North Fork Sections are nearing completion. By the time we complete these sections, I expect additional parts of the planned route will be constructed and ready for our enjoyment. 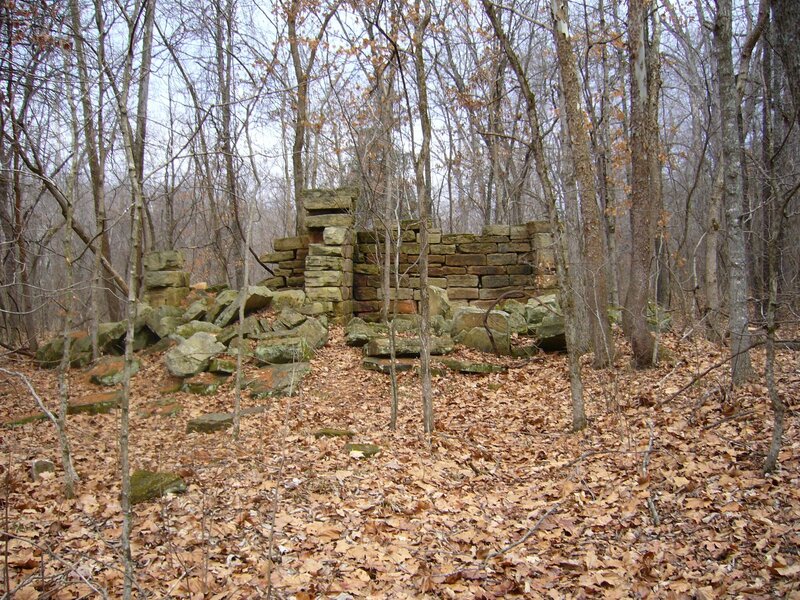 These cabin remains lie in the campground at the trailhead – those are sandstone blocks which I suppose must have been transported from the Lamotte formations some 30 miles to the east near Ste. Genevieve. There was much to see in the vicinity of Hazel Creek. As an orchid enthusiast, I was pleased to find these Adam and Eve orchids (Aplectrum hymenale), also known as puttyroot, growing in healthy numbers on the hillside above the valley. 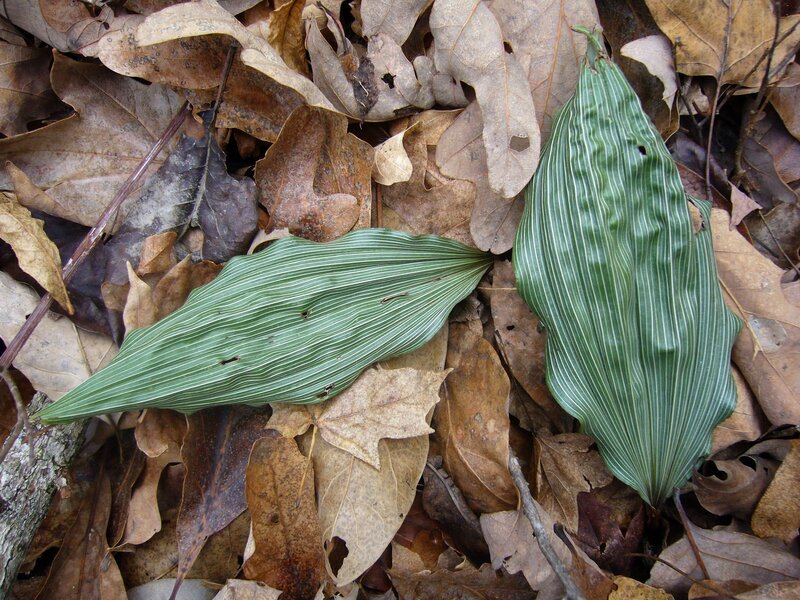 The single leaf of this unusual plant is dusky grey-green in color, deeply creased and looking like crepe paper. They appear in late summer and persist until the plant flowers the following spring. 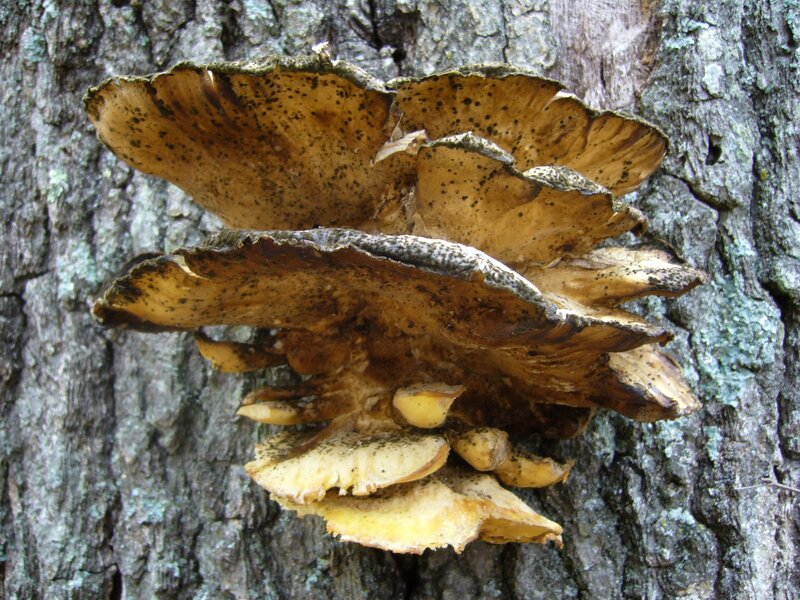 Another of the shelf fungi was found growing on the trunk of a large, dead deciduous tree. My preoccupation with lichens continues. 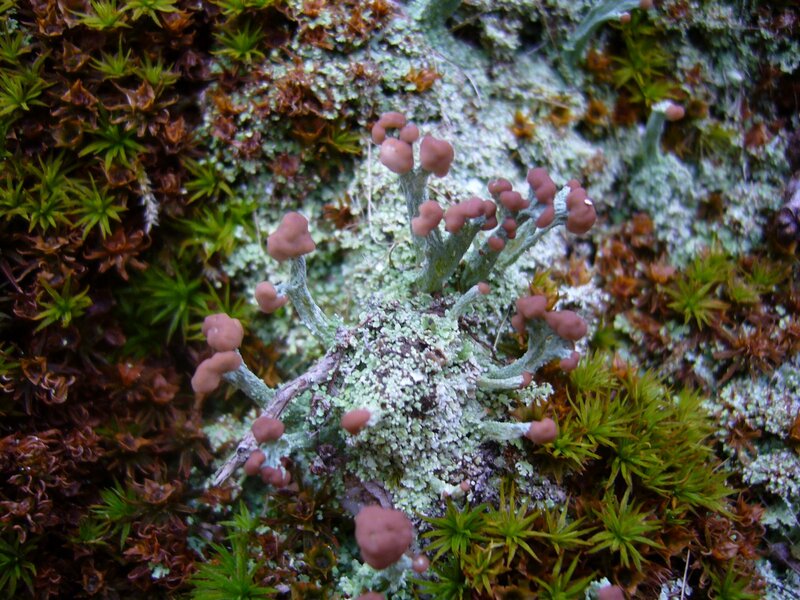 This colony of British Soldiers (Cladonia cristatella) was found growing in trailside rocks. This lichen is named for its resemblance to the uniforms worn by English soldiers during the Revolutionary War, although the spore-producing reproductive structures are not the brilliant red color as seen during the summer. Lichens are not plants, or even a single organism, but instead a symbiotic association between an alga (in this case, Trebouxia erici) and a fungus (in this case, Cladonia cristatella). Lichen scientific names are derived from the fungus part of the relationship. Puffball mushrooms have been a favorite of mine since I found my first colony during childhood and delighted in watching the ‘smoke’ fly as I slapped them with my hands. These days I’m satisfied to just look at them (and maybe poke one or two). 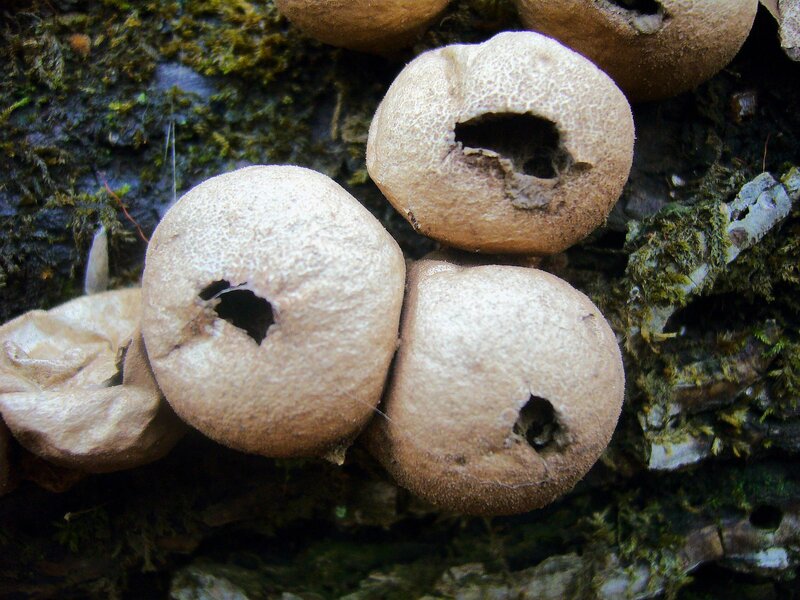 The term “puffball” actually refers to a polyphyletic assemblage of fungi distributed within several orders in the division Basidiomycota. I’m no expert (or even a novice), but I wonder if these apparently mature individuals might represent the pear-shaped Morganella pyriforme, a saprobic species that is considered a choice edible while still young. Please leave a comment if you know its identity. The trail was not particularly rugged but traversed across a number of ridges between the Hazel Creek and Trace Creek valleys. 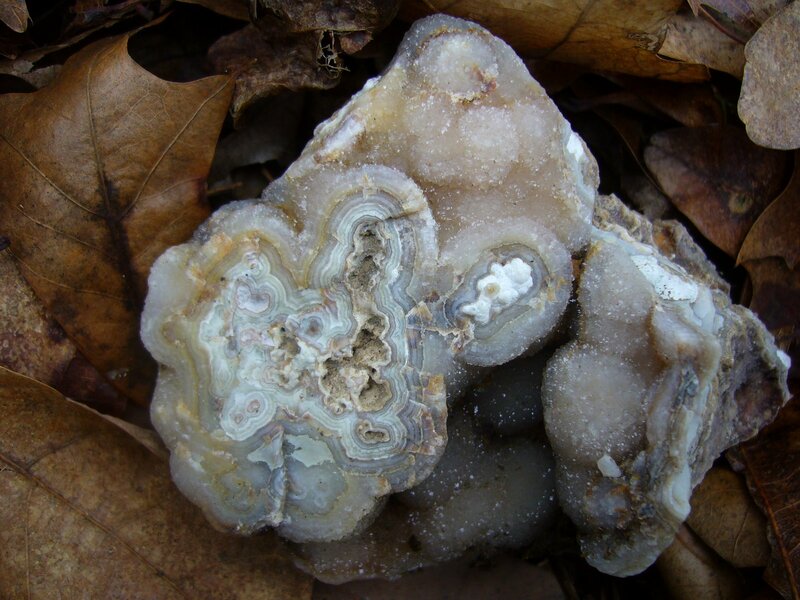 The bedrock was mainly chert, and along the trail we saw this quartz formation with its intricately formed interior exposed. 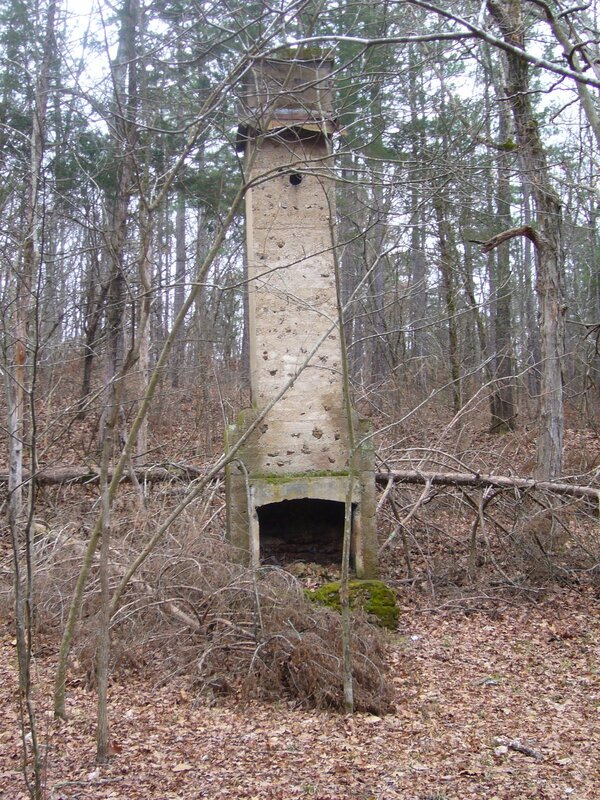 Approaching Trace Creek, this fireplace and chimney were all that remained of what was probably once a cozy little homestead. Obviously this house had not been constructed of sandstone blocks like the one at Hazel Creek. 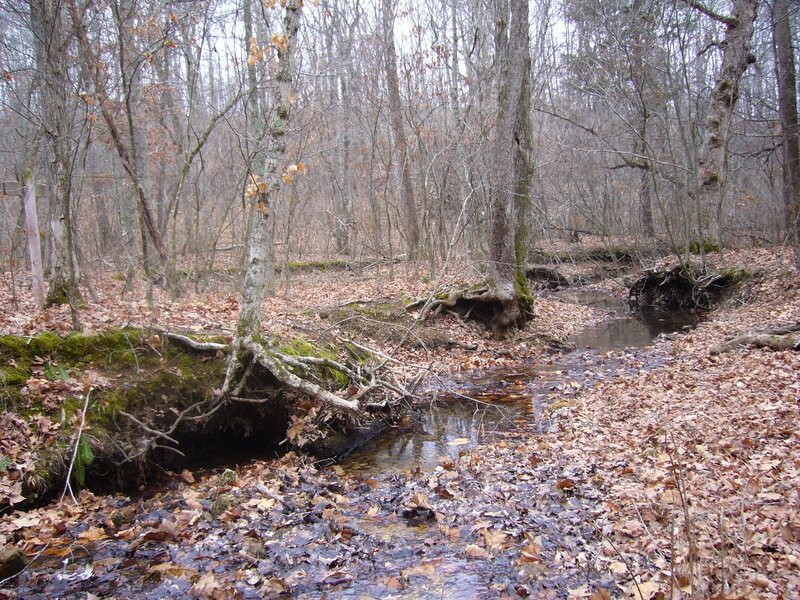 On each side of where the house once must have been stood two grand, old sugar maple trees (Acer saccharum) – we speculated they had been planted by the former residents and wondered what life was like in this isolated little part of the Ozarks back in the day. We reached the trails namesake, Trace Creek, about halfway through our hike, and by this time we were the Ozark Trail’s newest 200-mile veterans. It was a pretty little valley, and we stopped here for a bit to eat and rest. Adam and Eve orchids were plentiful here, and in looking for them I became surprised to notice how large a variety of green, herbaceous plants one can find in these deciduous forests during the winter, especially in the lower elevations (moister?). The final miles of the hike became more difficult, as my sore throat and congestion combined with the miles started taking their toll on me. We finished our hike at the Hwy DD crossing after 7 hrs of hiking, portaged back to the other car, and met up in Sullivan for our traditional post-Ozark Trail hike pizza dinner. 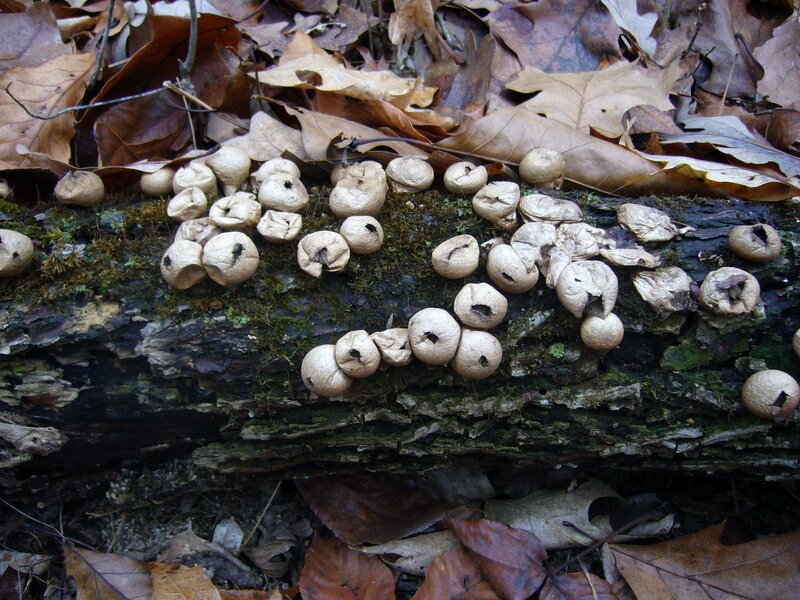 This entry was posted in Fungi, Orchidaceae and tagged Botany, cultural history, forest, geology, Hiking, landscapes, lichens, Missouri, mushrooms, nature, orchids, Ozark Trail, science, wildflowers. Bookmark the permalink. It was a great hike! Hiking 200 miles is significant. What is really significant is that nearly all of this distance has been through the best of Missouri’s Ozark forests. To me it is a sign that people are really trying to preserve nature for everyone. Seven years ago, I would have never thought we would ever get this far. I’m looking forward to concuring another hundred miles in the next few years. By the way, that little camera takes some really great photos. I’m going to have look into getting a new digital camera myself.